I have finally got a .com website! Hello my dear reads my new first ever shark book is now available on Amazon.com. It is called the The mystery behind the monster. I hope you can buy it and read it sometime soon. The mystery behind the monster is about shark attacks and why they do attack and it has some story of shark attack. And much more so I hope you can buy it and read it. I would love to hear what you think of it so please leave comments. The Broadnose sevengill shark or it scientific name Notorynchus cepedianus. Is a member of the Hexanchidae along with the Sharpnose seven-gill shark and the Bluntnose sixgill shark and Bigeye sixgill shark. It is the only extant member of the genus Notorynchus. It is recognizable because of its seven gill slits. Which most sharks only have five gill slits. This adaptation allows the shark to eat sharks, rays, fish, seals, and carrion. This sharks live in temperate areas worldwide, from the North Atlantic and Mediterranean, and from the shallows down to 135 m (450 ft) deep. The broadnose sevengill shark grows up to 10 feet (300 cm) long. I have been asking myself that same question. But I have to say no it may feel that way but there are more people in the water then 50 years ago. And shark numbers are still declining. More sharks are coming close to shore to feed. They would normal would feed in the oceans but because of over fishing sharks have to travel far closer to shore than normal and closer they come they are more likely to come in contact with humans. Sharks are still a mystery to us but we know more about them then we did 100 years ago. But the behavior is still another mystery we don’t know about them. Sharks have been around for 420 million years so you have to understand they would think like a dinosaur. Like crocodiles sharks have been on earth for a long time. So the crocodiles and the sharks have something in common. I believe that crocodiles and sharks have the same behavior. Like there was one shark attack the shark keep a close eye on it victim and anyone who came to close the shark would finish it off eating bit by bit in front of there eyes. Sharks have been seen doing the same behavior. Crocodiles do the same thing they will keep a close on it’s prey. I believe sharks are becoming more aggressive and will stand there ground. And if anyone comes in the invisible line they will most likely be attack. You will see the tiger shark it to blame for most fatal attacks after the great white in the United States. So on my list of dangerous sharks the Tiger shark is first and then the Bull shark is 2nd and last of them is the Great white shark. The Oceanic whitetip shark is dangerous and aggressive but only lives in the oceans around the world and it has been known to follow ships. And it kills most survivors from boat and air disasters. Some people believe that global warming is to blame for more shark attacks but that maybe be true but global warming was not a problem back in 1916 when the Jersey Shore shark attacks happen. But is it true sharks are having some trouble when it comes to food so they have to try new food and that is when shark attacks happen or the shark is aggressive and will stand its ground. 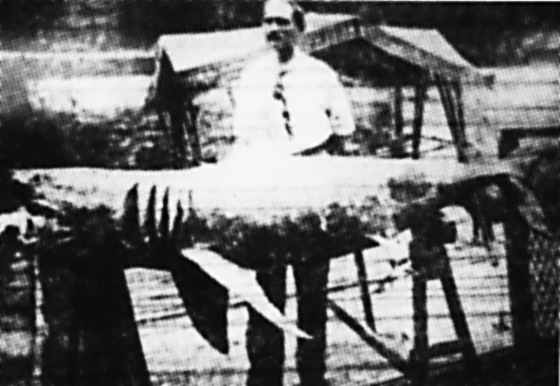 The sharks they was blamed for the 1916 Jersey Shore shark attacks was a Great White and a Bull shark. To avoid a shark attack you can follow the following it may save your life. avoiding areas where the remains of fish have been discarded into the water, such as near fishermen cleaning their catch. Shark attack fact number one: The odds of you getting attack are very rare. You are more likely to get hit by lighting and die. Shark attack fact number two is: There are three different attack the first one is the Hit-and-run attack – usually non-fatal, the shark bites and then leaves. The 2nd one is a Sneak attack – deep water attack, can be fatal. And the last one is Bump-and-bite attack – the shark bumps before biting. Reason one is the sharks are very curious creature and will find out if it is prey or not. And the 2nd reason most sharks that attack are young and have no idea what it is about to attack. And sharks have no hand so they use there teeth to find out this called a exploratory bite. After one bite they swim away. Sharks normally make one swift attack and then retreat to wait for the victim to die or exhaust itself before returning to feed. This protects the shark from injury from a wounded and aggressive target. However it also allows humans time to get out of the water and survive. Shark attacks may also occur due to territorial reasons or as dominance over another shark species, resulting in an attack. avoiding the water at dawn, dusk, or night, when sharks tend to feed. avoiding areas where sharks generally locate themselves, such as murky waters and steep drop-offs. avoiding swimming alone, always being near a group of people, and if possible, avoiding being at the edge of the group. refraining from excess splashing or movement. preventing pets from entering the water. avoiding shiny jewelry, tan lines and bright clothing, all of which can attract sharks. Like yellow and red black it a safe color most of the time. avoiding entering water if bleeding from an open wound or if menstruating. Only four have been involved in a significant number of fatal unprovoked attacks on humans: The great white, tiger, bull and the oceanic whitetip. These sharks are large and powerful predators they may sometimes attack and kill people. However they have all been filmed in open water by unprotected divers. 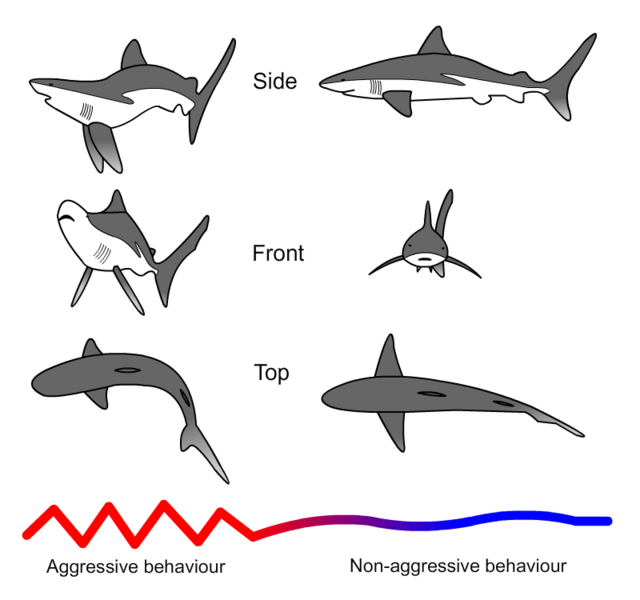 Modern day statistics show the oceanic whitetip shark as being seldom involved in unprovoked attacks. However, there have been a number of attacks involving this species, particularly during World War I and World War II. The oceanic whitetip lives in the open sea and rarely shows up near coasts, where most recorded incidents occur. During the world wars many ship and aircraft disasters happened in the open ocean, and due to its former abundance the oceanic whitetip was often the first species on site when such a disaster happened. Infamous examples of oceanic whitetip attacks include the sinking of the Nova Scotia, a steamship carrying 1000 people, that was sunk near South Africa by a German submarine in World War II. Only 192 people survived, with many deaths attributed to the oceanic whitetip shark. Another example was the torpedoing of the USS Indianapolis on 30 July 1945, giving a minimal figure of 60–80 killed by oceanic whitetips. Some survivors stated that tiger sharks were involved too. The four species responsible for a significant number of fatal attacks on humans, a number of other species have attacked humans without being provoked, and have on extremely rare occasions been responsible for a human death. This group includes the shortfin mako, hammerhead, Galapagos, gray reef, blacktip reef, lemon, silky, and blue sharks. These sharks are also large, powerful predators which can be provoked simply by being in the water at the wrong time and place, but they are normally considered less dangerous to humans than the previous group. 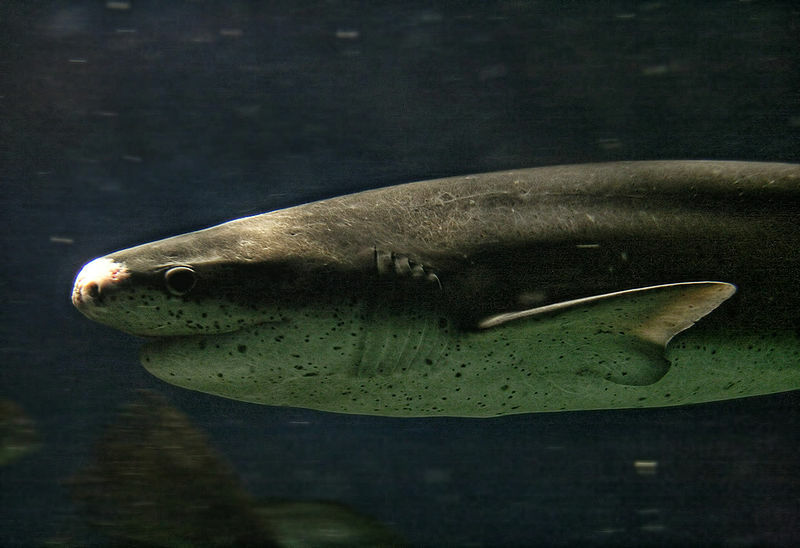 A few other shark species do attack people every year, producing wounds that can potentially kill, but this occurs either specifically because they have been provoked, or through mistaken identity due to water conditions or the like. But every year only an average of 41 people are killed by sharks, while over 100 million sharks are killed every year, a portion of which due to the demand for shark fin soup. 1. The Bull Shark is the most aggressive. It is the most aggressive of all the sharks. It can live in both salt and fresh water. And it will attack anything because of it’s aggressive. 3. The Tiger Shark is the 3nd most aggressive shark. It has been know to have human body parts in the stomach. These sharks generally hunt at night and will devour anything that comes in their way. 4. The Oceanic Whitetip Shark has been known to follow ships and wait for a meal. Most aggressive shark towards humans. It goes into a feeding frenzy especially if there are survivors from a ship wreck or air crash in waters. It will always be remembered that this shark was responsible for death of 600 to 800 sailors of the USS Indianapolis. 5. The Shortfin Mako Shark Shortfin. This shark can swim at the speed of 46 mph and even jump 28 feet up in air! The Mako shark is one of the four warm blooded sharks that is known for 42 reported attacks on humans. There have been 2 fatal attacks associated with the Mako shark. This shark reaches 9 to 13 feet in length and can weigh a heavy 1,759 pounds. 6. The Gray Reef Shark is one of the fiercest predators in the ocean world. It has an nictating membrane that covers its eyes when it is in attack mode. This membrane protects its eyes from getting hurt and it can go ahead and bite anything and everything in its path. The gray reef shark can grow up to 8.4 feet in length and 74.3 pounds in weight. There have been 8 reported attacks on humans by this shark and none of them have been fatal. 7. The Sand Tiger Shark It is one of the aggressive shark species and their aggressiveness begins right in the uterus. Is give birth to young who develop from eggs within the female shark body. The females have two uteri and that carry many eggs. Once the young shark develops in each uterus it will feed on other weaker fetuses till only one young shark remains in each uterus. There are 64 reported human attacks by sand tiger sharks with 2 fatalities. They are about 10 feet in length and weigh up to 350 pounds. 8. The Blue Shark It has been reported to attack 32 humans of which 3 attacks proved to be fatal. Blue sharks are somewhat explorers and their quest for exploration proves to be a costly affair for humans. They are famous for their exploring bites on small boats that proves deadly for most humans. The blue shark is about 12 feet in length and weighs 450 pounds in weight. 9. The Hammerhead Shark Of these 9 hammerhead species 3 are considered to be the most aggressive shark species. The hammerhead sharks are generally shy creatures but won’t shy off taking a bite off the limbs of swimmers who get close to them. Potentially the most aggressive of the hammerhead speices are scalloped hammerhead and the Whitefin hammerhead or the great hammerhead. These hammerhead sharks are about 10 to 17 feet long and weigh between 330 pounds to 1,100 pounds. 10. The Lemon Shark are native to the subtropical and tropical regions of the Atlantic Coasts of North and South America. This is one finds itself on the 10 position in the list of most aggressive shark towards human as there have been reports of 22 lemon shark attacks since 1850. Luckily none of these shark attacks was reported to be fatal. Lemon sharks can grow up to 12.6 feet long and weigh well over 400 pounds. There have been many myths about sharks over the years and not all of them are real. I was watching a show on animal planet about sharks and there feeding frenzy. And what makes them attack humans and will they eat anything. Well I must say they I was surprise about the most of the sharks. Like they say that the Tiger shark will eat anything. But that is not true. They tested the shark will different things like a license plate but the Tiger shark bit it and did not even eat it. So they myth about the Tiger shark is false. But they do know the different from a human to their prey. Great white see in color and they will attack people dress in yellow and red. But black is a safe color just as long as you don’t wear shine things like rings and necklaces etc. Because they look like fish gills. Most sharks are optimist like crocodiles are and will eat it if they are really hunger. But they know what they are eating. They tested the Great white shark and they put a fast beating heart in the water and a slow beating heart rate in the water and the great white went for the fast beating heart why? We don’t know. Maybe because they think it sounds like a fish heart and they go for it. And what I surprise by is they put human blood and tuna blood in the water in a blood bag and the great white went for the human blood. And they tested the Reef shark and when it is feeding it will go in to a feeding frenzy. And when hand feeding they close their eyes and will bite your hand if you don’t let go of the food. But they will come and have a close look. They will attack humans. Lemon sharks will attack humans. They tested it and made a human like legs and put it in the water and the Lemon shark took both of the legs but did not eat them. And the legs had not bait or anything on them but still the sharks took them. Myths: Sharks have poor vision. Fact: Their eyesight is just fine and the great white like many sharks can see in color. Myths: Sharks don’t get cancer. Fact: Sharks like us humans do get cancer it is just that we don’t see it. Myths: Shark attacks are common. Fact: Shark attacks are rare but when they do happen there are good odds you will live. Myths: Sharks will eat anything including you. Fact: Not true shark are picky eaters. Myths: Sharks are dumb robotic killers. Fact: Sharks are just as smart as small mammals.